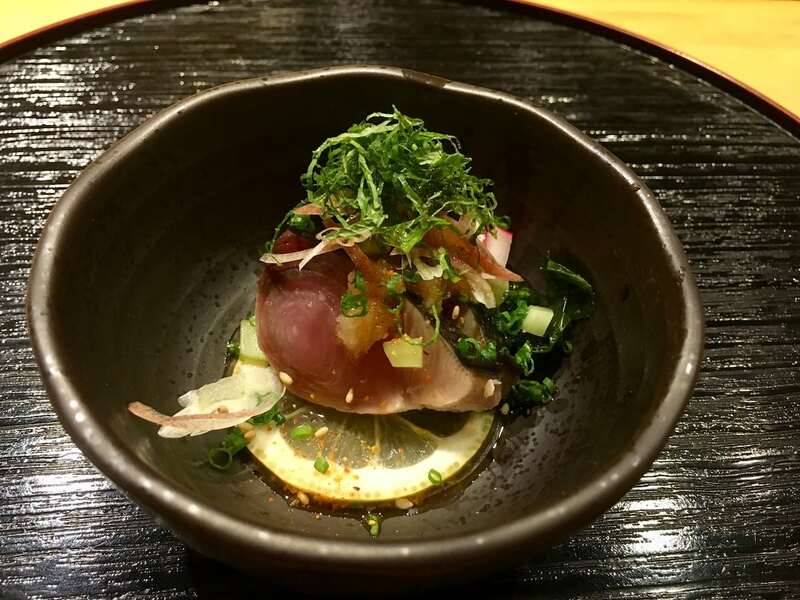 Dinner at Sushi Tetsu, London’s most exclusive restaurant? Eating alone at five thirty in the evening, down a side street in Clerkenwell, used to be pretty low on my tick list. But this was different. It was an evening I’d been waiting 18 months for. I’d finally bagged a (single) seat at London’s most exclusive restaurant. Of course ‘exclusive’ can mean many different things. Sure there are ‘sleb heavy haunts where if you ain’t been on Big Brother you’re not getting in. There are Michelin starred restaurants for which you have to book a year in advance and write an essay detailing your credentials. For god’s sake, there’s even a decent brunch place round the corner from me which boasts an hour long queue at 8am on Sunday mornings. But the place I’m writing about is in its own category of exclusive, so exclusive that more people than not haven’t even heard of it. But that just adds to Sushi Tetsu’s mystique. The owners don’t give interviews, they don’t like articles being written (sorry but I waited 18 months and paid a substantial wedge so I will be breaking with this protocol) and diners are given strict rules regarding photography; you’re allowed to take photos of the food directly in front of you and nothing else. What makes Sushi Tetsu truly exclusive however is the sheer awkwardness of getting a seat. Negotiating your way through the byzantine booking policy is not for the mere lover of fashion or novelty. You’ve really got to want to go to Sushi Tetsu to bother. The instructions as laid out on the restaurant’s website are longer than my word limit for this review, but in a nutshell there are two ways to get in. You can’t reserve in person or send an email, you have to call. On two designated Mondays each month. The line is invariably engaged and statistically you’re probably more likely to win 10 million pounds on a scratchcard than have your call answered. The second option is the restaurant’s Twitter account, solely dedicated to cancellations. Every few days it pings out a crumb of hope, generally in the form of ‘We have one seat available tomorrow at 5:30pm.’ It’s a fingers on buzzers scenario in which you’re destined to come second. Refusing to be defeated, I tried for a year and a half until one momentous Thursday I did it. I got a seat via the ‘one person at 5.30pm’ Twitter route. In a state of elation I signed up for the ‘chuck what you want at me and I’ll eat it’, omakase option. It was £96 for a chef’s selection of sushi and sashimi. Not the cheapest evening out but it would be worth it. Wouldn’t it? When the big day finally arrived I was ready. Having plotted the route in advance to make sure I got there on the dot, I arrived outside the compact, surprisingly modest venue and was seated in the middle of five places at the sushi bar. There were also two no-shows. I can only imagine one of them had died or cancelled to spite the system. Front of house Harumi Takahashi, explained how everything worked and politely but firmly enforced the no photo rule with the two guests to my right who had evidently not read the rules dossier we’d all been emailed. Shame on them! Star of the show, chef Toru Takahashi, nicknamed ‘Tetsu’, then begun service. 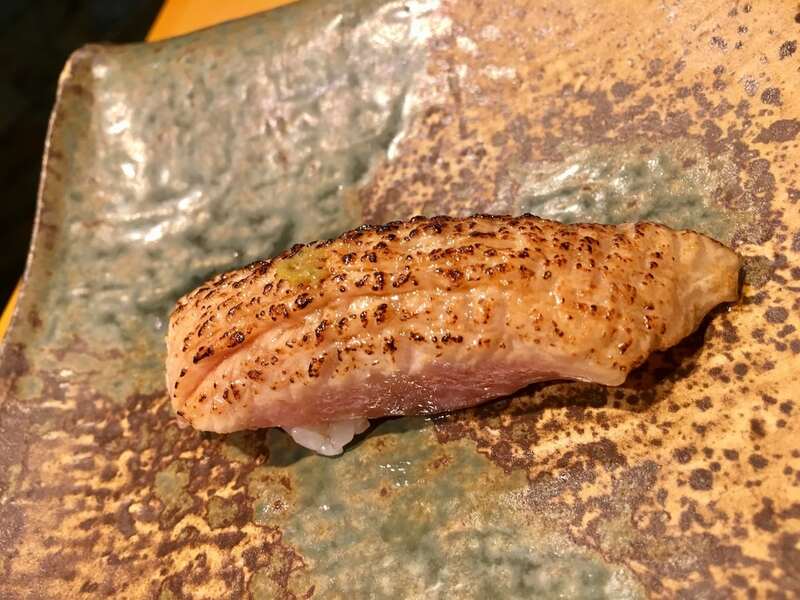 Toru sliced, spliced and garnished with quiet efficiency and every bite was a subtle delight. 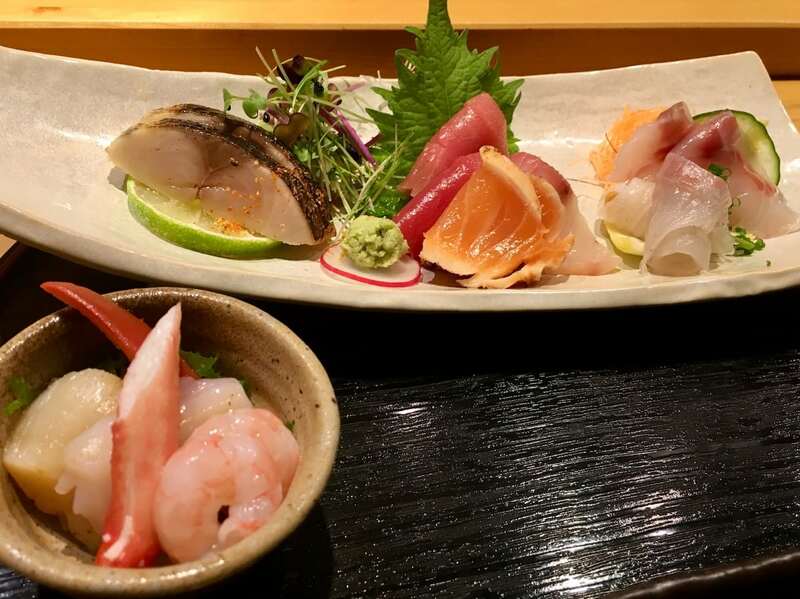 From the turbot and tuna sashimi to scallop with ponzu and some beautiful squid sushi, it was simple, unfussy perfection. The hand-ground wasabi fresh from the root was a rare treat. There was nothing fancy about it, just lovely, beautifully prepared seafood and expertly seasoned rice. The service was also immaculate; courteous and friendly but unobtrusive. And Toru wasn’t the serious sushi master I’d expected. In between serving up plate after plate of delicious morsels he chatted away to us all. I’d lived in Osaka for a few years, not far from Kobe where Toru had trained and we compared Japanese slang for the time it took him to prepare a lovely bit of salmon. The 90 minutes was a quiet masterclass in precision cooking and gracious service. Walking back on to the street at the end of the meal, I felt like Mr Benn coming out of the costume shop and into the real world after a particularly satisfying adventure. So was it worth price – and the wait and the eating by myself at 5.30pm? Yes it was, not just for the food but the whole experience. Don’t get me wrong, if you don’t like raw fish, the banter’s probably not going to justify the hassle but if you do, persevere, it’ll be worth the endless phone calls and frantic tweeting. 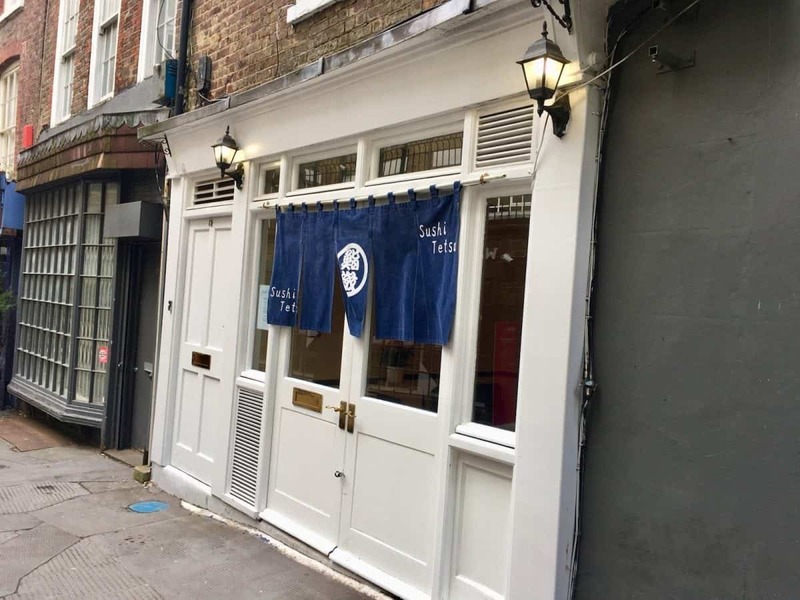 Sushi Tetsu can be found at 12 Jerusalem Passage, London, EC1V 4JP.